If you are a fan of lighthouses, Florida is a great travel destination – it’s a lot of fun to visit many Florida lighthouses.. With 1800 miles of coastline, Florida boasts twenty-nine lighthouses of many shapes and sizes. Although not all are open to public tours, fourteen of them are, and another six have grounds that can be toured. The Boca Grande Lighthouse is a quaint structure consisting of a white frame dwelling with green shutters and a black lantern tower. 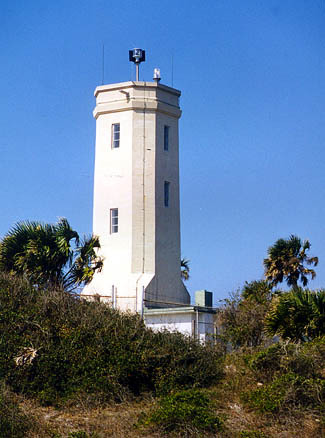 The active lighthouse is currently operated by the Florida State Park Service. It was constructed in 1890, but the architect and builder are unknown. It is only 44 feet tall, with 60 steps to the top. Boca Grande is located on the west coast of Florida near Cape Coral. Although much better known for space shuttle launches, Cape Canaveral also has an active lighthouse that was recently re-opened to the public. It is a conical iron tower with black and white horizontal bands, and it’s located on the Cape Canaveral Air Force Station. The brick lighthouse is 145 tall with 179 steps, and there is also an oil storage house. Because of its location, this lighthouse was previously only open to US Citizens. However, foreign nationals may now visit if they provide passport information at least 72 hours in advance of their tour. The Cape Florida lighthouse is located in Key Biscayne, just south of Miami. The 95-foot active lighthouse is open to the public, along with the keeper’s dwelling, detached kitchen and privy. It is a whitewashed brick conical tower with a black lantern at the top of the 112-step climb. The lighthouse was restored in 1996, and there is also a museum in the keeper’s dwelling, a video in the kitchen, and a gift shop. This lighthouse features an interested history. Originally located on Little St. George Island and only accessible by boat, the Cape St. George lighthouse was affected by beach erosion and developed a significant lean. It was listed as Florida’s most endangered lighthouse. During the summer of 2000, it was straightened by giving it a new foundation, but conditions worsened and it finally collapsed in 2005. The lighthouse was then reconstructed from the original materials on St. George Island and opened to the public in 2008. The Cape St. George lighthouse is a 74-foot white conical tower topped with a black lantern. It is active from November through April, but is not lit from May to October in support of nesting sea turtles (who navigate by the moon and are thrown off-course by artificial lights). There is also a museum and a gift shop. Cape San Blas lighthouse is located on the Eglin Air Force Base near Apalachicola, Florida. The 96-foot structure is not currently active. It is a white square pyramidal skeletal tower with an enclosing stair column and black lantern. There are also two keeper’s dwellings and a brick oil storage house. The current structure is the fourth lighthouse on the location. The first two were destroyed by hurricanes in the 1850s. The third one collapsed in 1882 after erosion left it in 8 feet of water and reached only by boat. The current lighthouse originally stood 1/4 mile from the current location, but was moved due to erosion. 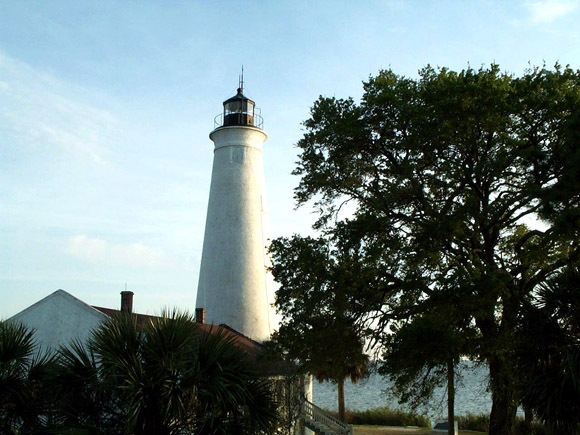 Cedar Keys barely qualifies as an open-to-public lighthouse, as it is open for only two days each year on the third weekend in October. 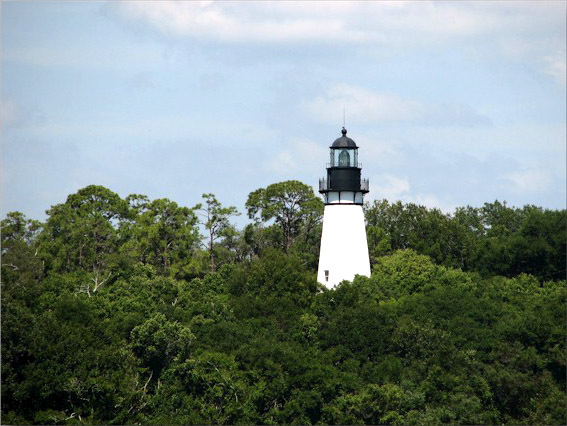 At 33 feet tall, it is the smallest lighthouse in Florida, boasting on 35 steps. It is a white house-style lighthouse with a white lantern, constructed in 1854. The original brick structure has had frame additions, and there is also a water tank, cistern, and oil storage house. The Hillsboro Inlet Lighthouse is located in Pompano Beach in southeast Florida. The skeletal structure is white on the bottom half, and black on the top, with a black lantern. It is 142 feet tall, with 175 steps, and was first lighted in 1907. It is only open four times a year. The Jupiter Inlet lighthouse, in Jupiter on the Atlantic coast of Florida, is an active lighthouse that is operated by The Loxahatchee River Historical Society. It is 108 feet tall, and is built on a 48 foot Indian mound. The red-washed brick conical tower has 105 steps leading to the black lantern. 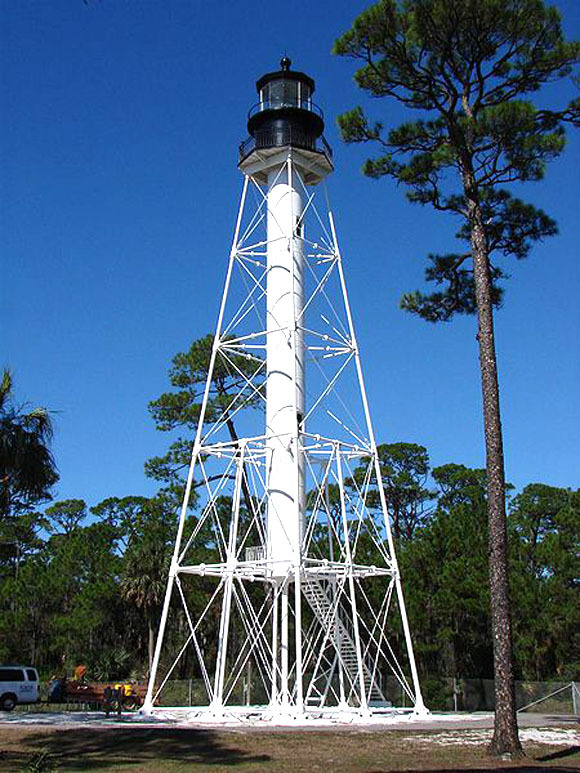 It was constructed between 1854 and 1860, and is thought to have the oldest first-order Fresnel lens throughout Florida. In addition to being open to the public, there are also sunset tours that require reservations. It was restored in 2000, and also has a museum and gift shop. Key West has one of the more popular Florida lighthouses due to its location as a popular travel spot. 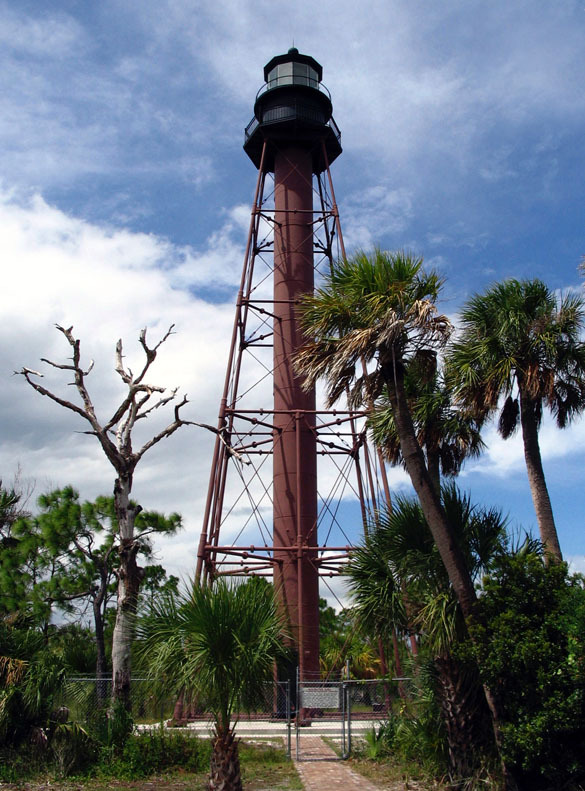 The Key West lighthouse is no longer an active light, having been deactivated in December of 1969. It was originally built in 1847, and is 86 feet tall with 98 steps. It is a whitewashed brick conical tower with a black lantern. Located on Whitehead street in Key West, the restored keeper’s dwelling now houses a museum. There is also a privy, an oil storage house, and a chicken coop, in addition to the lighthouse itself. The Pensacola Lighthouse, in western Florida on the panhandle, is an active lighthouse that is 150 feet tall. The bottom third of the tower is painted white, while the top two-thirds are black, as is the lantern. It was constructed from 1856 to 1858, and first lighted on New Year’s Day in 1859. One of the most unique aspects of the lighthouse is that visitors can watch the Blue Angels practice, gaining a unique view from the lighthouse itself. The keeper’s dwelling is a two-story brick building from 1869, which has display rooms open to the public. The tower is also open for public climbs. Ponce Inlet is located on the Atlantic coast of Florida, just south of Daytona Beach. Its lighthouse is an active red-washed brick tower with a black lantern, standing 175 tall and boasting 213 steps. 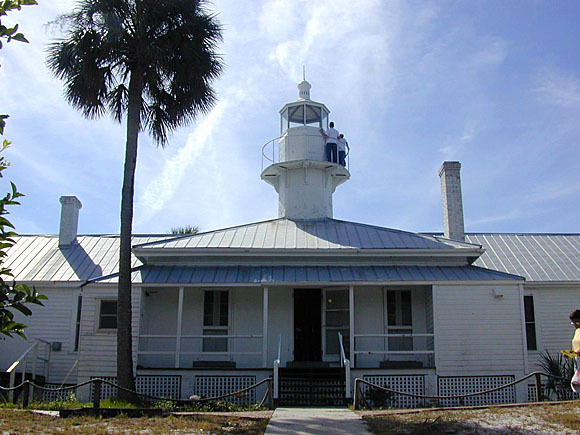 It was built in 1887 and is the only one of the Florida lighthouses to be listed as a National Historic Landmark. 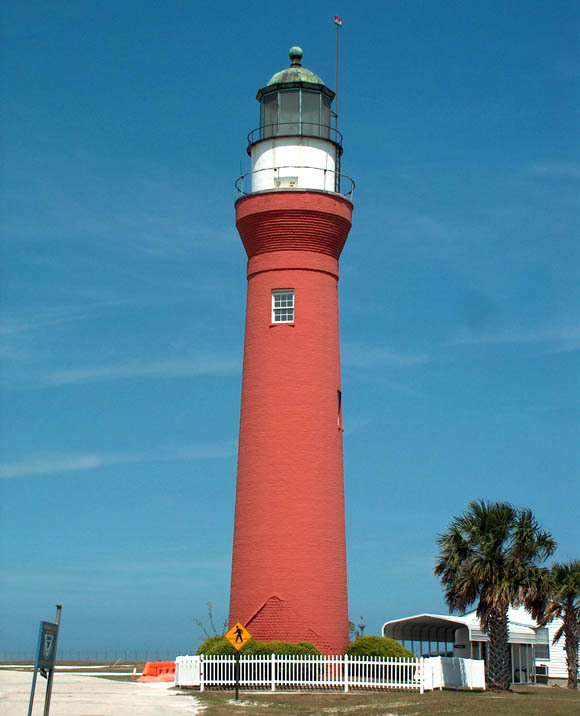 It is the tallest brick lighthouse in Florida, and the second-tallest throughout the United States. There are also three keeper’s dwellings that have been converted to museums, an oil storage house, a pump house, and privies. The St. Augustine lighthouse is 167 feet tall with distinct black-and-white spiral stripes, topped by a red lantern. It is an active lighthouse, built of brick in 1871, restored in 1994-95, and restored again in 2000. The museum, gift shop, and lighthouse tower are open to the public. This is another one of the more popular Florida lighthouses due to the number of tourists who visit St. Augustine. 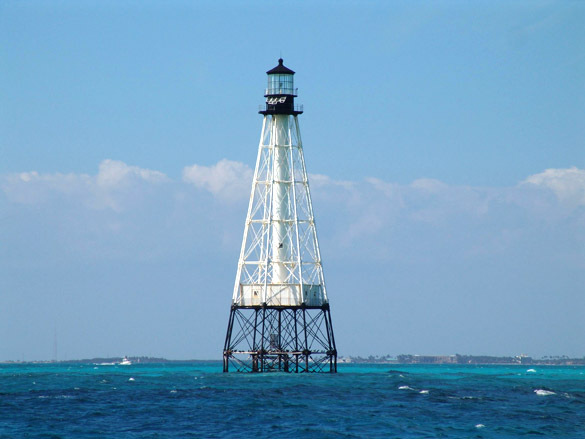 The Tortugas Harbor lighthouse is only accessible by boat, and is 43 miles west of Key West, Florida. It consists of a white dwelling on a brown pile foundation, and is topped by a black lantern. At a height of 82 feet, it is a relatively small lighthouse. It was built in 1886 but the architect and builder are unknown. It is currently operated by the US Coast Guard. 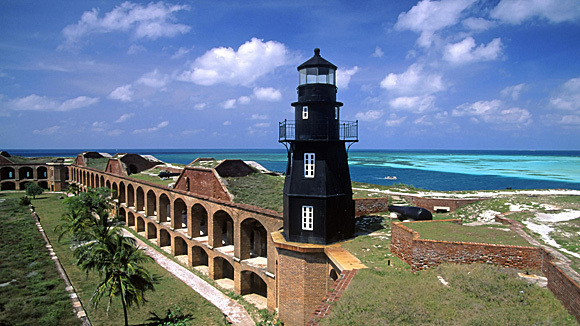 The Dry Tortugas lighthouse is a 157-foot tall brick lighthouse with 204 steps. The bottom half of the lighthouse is painted white, and the top half is black. It is topped by a black lantern. There is also a 1926 dwelling, a former kitchen, and an attached oil house. The Dry Tortugas lighthouse is currently active and operated by the US Coast Guard. The grounds can be visited, but the lighthouse must be reached by boat or sea plane from Key West. There is also a gift shop. The Egmont Key lighthouse is a small, white lighthouse constructed of brick, iron, and concrete, located in St. Petersburg, Florida. Is was originally constructed in 1857-1858, and it is only 76 feet tall with 99 steps. Normally only the grounds are open to the public, although occasionally the base of the tower is opened as well. The lighthouse is only approachable by boat. The Gasparilla Island Lighthouse was originally built in Delawarein 1891, but was moved to Gasparilla Island (near Cape Coral in SW Florida) in 1927. Although you cannot enter the lighthouse, you can easily approach it for photographs. 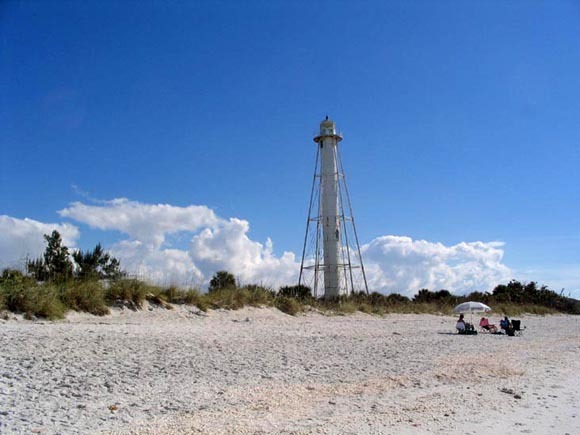 It stands on the road leading to Boca Grande Lighthouse, both within the Gasparilla Island State Park. This lighthouse is 105 feet tall, with a white steel skeletal tower. It is currently active and has a range of 12 miles. 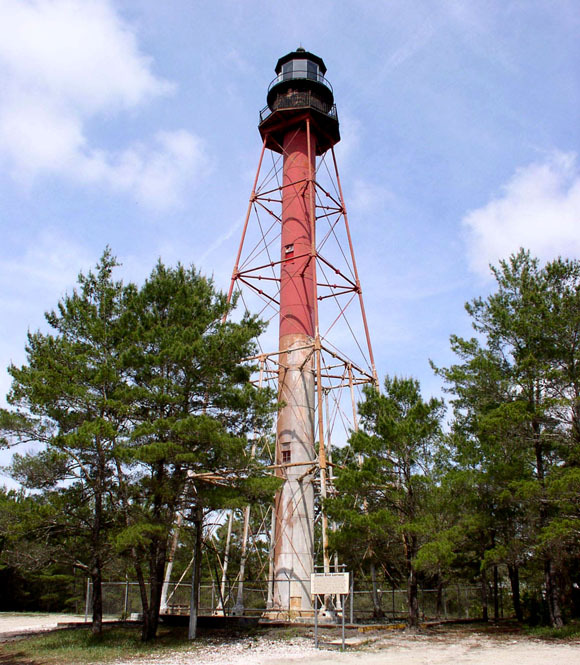 The Crooked River lighthouse is not active, but is maintained by the Carrabelle Lighthouse Association. It is 103 feet tall, has 138 steps, and is a square pyramidal skeletal tower. Its lower half is painted white, with a dark red upper half and a black lantern. It was constructed in 1895 and deactivated in 1994. The Mayport Lighthouse in Jacksonville, Florida is a 64-foot tall active lighthouse on the grounds of the Mayport Naval Station. It was built in 1954, and has 71 steps. It has a white square masonry tower with reinforced concrete, as well as a 1950’s keeper’s dwelling. It is operated by the US Navy, and although the grounds may be visited, the tower is closed to the public. St. Marks Lighthouse is near Tallahassee, on the Florida panhandle. It is on the grounds of the St. Mark’s National Wildlife Refuge, and the grounds are open to refuge visitors. The active lighthouse stands 88 feet high and has 80 steps. It is a white-washed conical tower topped by a black lantern, constructed in 1829-1830 and in 1842. There is an attached keepers dwelling that was built in 1871. Another lighthouse that is closed to the public, except for the grounds, is the Sanibel Island lighthouse off the coast of Cape Coral. It is a brown square pyramid skeletal tower with a staircase cylinder in the middle that was built in 1884. It stands 112 feet high. It does have a museum and a gift shop, although the two keeper’s dwellings are currently used as residences for city employees. There is also a brick oil storage house. 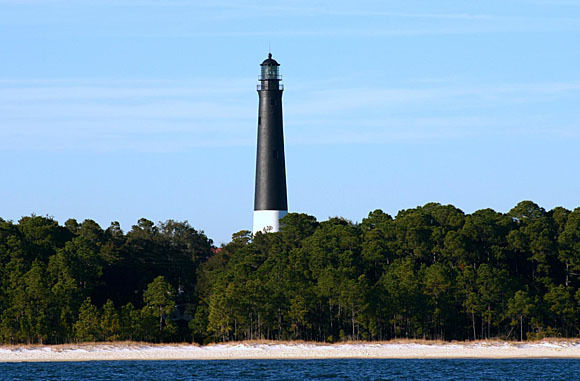 The lighthouse on Amelia Island was constructed in 1838-1839. It is 64 feet tall and has 69 steps. The brick tower is white and cone-shaped, and is topped by a black lantern. Although the grounds are open to visitors, the lighthouse itself is not. However, the city of Fernandina Beach, which owns the lighthouse, is planning to restore it and open it to the public with funding from a state grant. In addition to the tower, there is also an oil storage house and a dwelling for the lighthouse keeper. The Amelia Island lighthouse is currently operational. Anclote Key is located in the Anclote National Wildlife Refuge in Dunedin, Florida. The active lighthouse is 96 feet high and has 138 steps. It is a rust-colored, square, pyramidal skeletal tower with a black top. Originally, the entire lighthouse was black. It was constructed in 1887 and also has an oil house and cistern. The St. Johns River lighthouse in Jacksonville is not an active lighthouse. It was constructed in 1858 but deactivated in 1929. It is a red-washed conical brick tower with a white lantern, which was repainted by the Navy in 2000. It can be viewed from outside the perimeter fence of the Mayport Naval Station. 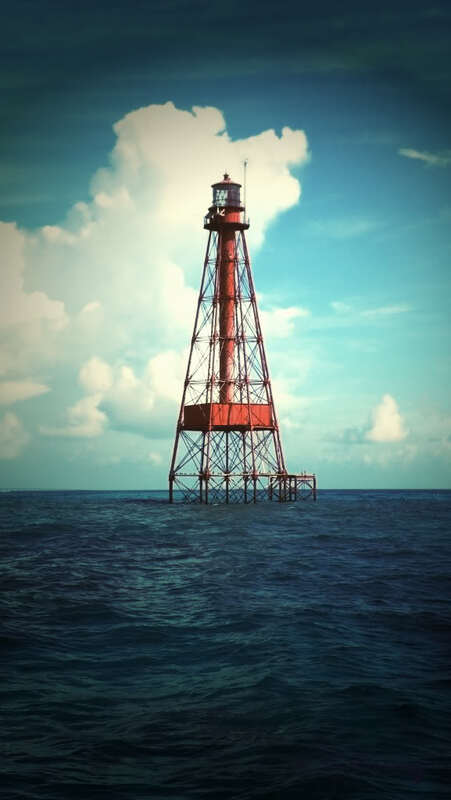 There are six reef lighthouses along the Florida Keys. These lighthouses exist off-shore and none are currently open to the public. However, the Florida Keys Reef Lights Foundation has been formed and plans to create a museum and open all six lighthouses to public tours. 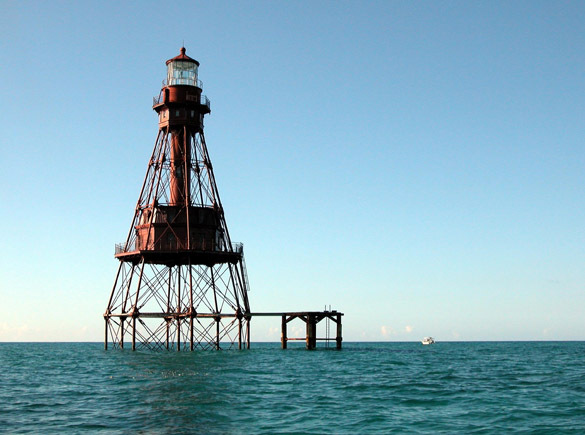 The Alligator Reef lighthouse is a 150-foot operational lighthouse on a skeletal tower made of wrought iron and wood. It is operated by the US Coast Guard and is not open to the public. However, the Allegator Reef lighthouse can be seen from Islamorado in the Florida Keys. It was constructed between 1871 and 1873. The American Shoal lighthouse is another off-shore, skeletal-tower lighthouse that stands 124 feet high. It was constructed in 1879-1880. Although it is not open to visitors, it can be seen from the shore on Sugarloaf Key and approached by boat. This lighthouse is brown with a white staircase and has brown octagonal living quarters. The American Shoal lighthouse was constructed in 1879-1880. The Fowey Rocks lighthouse is 125-feet tall and is an active, operational lighthouse. It has a brown octagonal skeleton, and an octagonal dwelling with green trim. It is not open to the public, but can be seen on a clear day from the top of the Cape Florida lighthouse. It can also be approached by boats from the Key Biscayne and Miami areas. The Fowey Rocks lighthouse was built in 1877-1878. Another active lighthouse, this time at Carysfort Reef, cannot be seen from land at all. Boats can be chartered from Key Largo to view the lighthouse. The Carysfort Reef is a dark red octagonal skeleton with a conical dwelling, and a stair cylinder in the middle. It stands 112 feet high and was built in 1852. 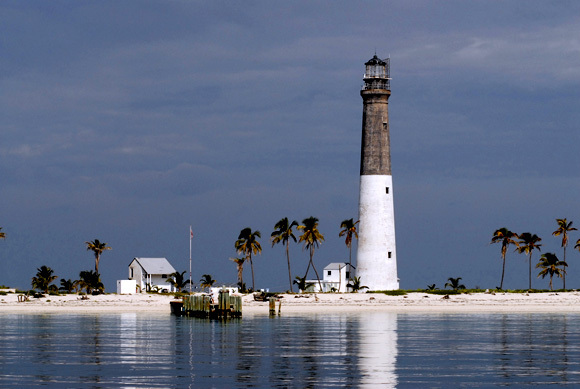 The Sombrero Key lighthouse is a 156-foot operational lighthouse with 133 steps. It has a brown octagonal-pyramidal skeleton. It can be approached by boats from Marathon, and is also visible from land at the Sombrero Beach State Park. It was built in 1857-1858. Sand Key Lighthouse can be approached by boat from Key West. It is 132-feet high with 112 steps. The lighthouse with its brown pyrimidal skeletal tower was constructed in 1853-1853. It has a white lantern. This lighthouse is currently active, but was restored between 1989 and 1996 and did not operate during that time. The lighthouse keeper’s dwelling at Sand Key accidentally burned down in the 1960s, and has never been replaced. We hope you’ve enjoyed this tour of Florida Lighthouses and that you’ll get a chance to visit some of them soon. 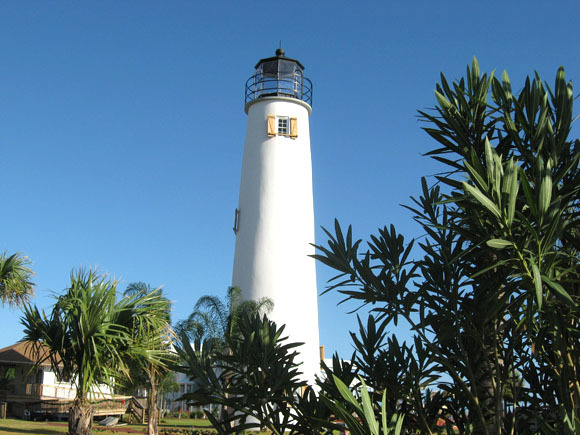 Our map and guide to Florida lighthouses has directions to viewing spots for all lighthouses in the state. Florida is one of my fav destination, thanks for sharing this would love to explore these options. This is one the most beautiful light house i have ever seen in my life. This is really amazing and wonderful. I would love to visit this place. Really fantastic view. Florida is awesome place, would love to explore it.